Mom, I'm sorry for not telling you, but it has been an incredibly embarrassing aspect of my life for the past several years. I have only started to be vocal about it over the past few months, and I'm trying to be more open about it for the purposes of overcoming it and educating others about a disease that not many people know about. The name of the game is dermatillomania (see also its sister disease dermatophagia), and it is awful. Thankfully, I have a somewhat mild case, but it is something that has been plaguing me for quite some time now. What the Hell Am I Doing to Myself? Honestly, I don't know when it started. I've been doing it for as long as I can remember, but I didn't really consider it to be that big of a deal until I found out that it was a mental illness my Sophomore year of college. To those unfamiliar with the affliction, dermatillomania is an impulse control disorder frequently paired with obsessive-compulsive disorder. This particular disorder is characterized by the uncontrollable urge to pick at one's skin (dermatophagia is characterized by biting at one's skin instead of picking), oftentimes to the point where physical damage (i.e. sores, wounds, scarring, & skin discoloration) is caused. Like I said, I have a mild case, and as of right now it's mostly contained to my fingers (most specifically my cuticles and other areas surrounding my nail beds). Whenever I'm sitting in a meeting at work or just watching a movie at home, if I don't have a pen in my hand or twiddling with a bit of string or sommat, I am picking at my fingers. I don't know why; it doesn't make sense to me either, so don't expect me to provide you with a "why" here. Most of the time, I'm not even aware of it. 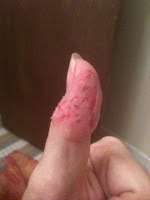 It's not until I've taken off a layer of skin or caused my finger to bleed that I even notice I've done anything at all. The first time I remember doing anything like this to myself was in elementary school. I was on a travel soccer team, and sometimes at the end of practice, while we were taking off of our shinguards and cleats, we would have a recap going over what we did that day. During these recaps, I would sit there and, some of you might find this disgusting, pick at the skin on my heels. This would normally only happen during the Spring, when the fields were wet. The sogginess tended to seep through my cleats and socks, making my heels pruny. I would pick at them until I picked giant dents nearly half an inch thick off of my heels. It got so bad that one of my coaches took notice and talked about saying something to my Mom. I don't know if he ever did, but I don't remember actually having a talk with my Mom about it. As far as I knew, my secret was safe. But then again, at this point I didn't think this behavior was weird, so it wasn't so much of a secret. It was just something I did every once in a while. No biggie. Then we get to middle school, also known as everyone's favorite party. Puberty turned my face and shoulders into a veritable canvas of hate - quite literally - as I picked at every single blemish that popped up. I still have scars that I tell people are from a severe chicken pox episode in the 5th grade. My Mom thought it was just really bad acne and bought me ProActiv, but the truth was that I was picking my pimples, and that only exacerbated the problem. Thankfully, puberty ended, and I only have to deal with stress-induced blemishes every once in a while due to the fact that I have been blessed with marginally good skin (thanks, Mom). I found out about this disease in my Sophomore year of college, a really rough time in my life. I was really low emotionally, my cuticles were in a constant state of bloodiness, and my face wasn't doing too much better. I reached out to my mother for help, and she directed me to a therapist who diagnosed me with clinical depression and dermatillomania / dermatophagia. My therapist prescribed Wellbutrin, an SSRI, and that seemed to help my mental state, but I have never been able to get control of this skin picking. That's what makes it so frustrating. I can't control it. It's not like I can just say, "Stefers, this is stupid. Just stop doing it. You control this." I wish like Hell I could. But that's not how it works. It's a compulsive urge that does not go away until I do it. I can't not do it, no matter how hard I try. I have even asked friends to give me a quick slap if they ever see me picking while they're around. But it doesn't work. Nothing works. The truth is that I don't have control. None whatsoever. So here I am, 5 years post-diagnosis, and I'm still picking the crap out of my hands. I'm no longer on meds for depression (I was only on them for about a year), and that's the way I like it. The less medication the better, honestly. At the end of the day, it's just something I have to deal with. It's tough, and it's frustrating, but that's the way it is. So that's that. Anyone else out there with any issues like this? I know I'm not alone, but actually hearing personal stories would help greatly. Commiserate with me, my lovely readers!! P.S. This is a part 1 of 2 installments. Expect the next one in about a month. I have the same problem, and have since I was a teen, when I was diagnosed with clinical depression. I've dealt with the depression--at least for the most part--but have never tackled this issue. Like yours, mine is pretty minor and not something I've really ever thought about all that much. It's only an issue with me when I manage to peel off enough skin to start bleeding. Ah Stef, the joys of OCD mild or severe! I started out of boredom. But I have to already have and issue... like you I don't pick at the healthy stuff. Being fairly pale skinned the summer burn started me. If I would start to peel I always helped the process along. My legs looked like I had been attacked by blackberry bushes... which were an easy scapegoat for a while. If I get chapped lips I peel or chew. And everyone who gets them does it to some extent. So no one really sees the disease part of it. I wonder if part of the why has to do with being bullied or "picked" on. My sister has some unhealthy habits. And the only thing that I can see that we have in common is that we pick at the things our mother was most critical of that somehow managed to get into the school yard and get reinforced. The only control for it is to have something in your hand.